MILWAUKIE, OR—Dark Horse Books is pleased to offer Troll Bridge, a beautiful graphic novel adaptation of a tale from the mind of master storyteller Neil Gaiman (Sandman), illustrated by artist Colleen Doran (Sandman, Orbiter). Based on a story originally published in Gaiman’s Smoke and Mirrors: Short Fictions and Illusions, Troll Bridge is a tragic coming-of-age fantasy masterpiece. The artwork of the inimitable Colleen Doran makes this book a gorgeous new addition to your Gaiman library. “She showed me an unusual style that isn’t like classic comics. Her pencils are wonderful, layered full-color drawings. They’re subversive, more like children’s book illustrations from 50 years ago,” said Neil Gaiman in an exclusive interview with Publishers Weekly. 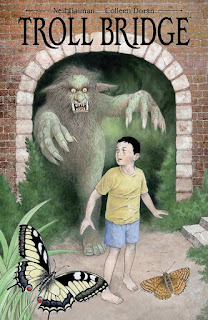 Troll Bridge tells the story of Jack, a young boy whose world was full of ghosts and ghouls, one of which—a ravenous and hideous troll—would haunt him long into manhood. As the beast sups upon a lifetime of Jack’s fear and regret, Jack must find the courage within himself to face the fiend once and for all. Look for new hardcover editions of Gaiman’s Creatures of the Night and The Facts in the Case of the Departure of Miss Finch in 2016! Troll Bridge is in stores September 14, 2016. Colleen Doran is a cartoonist/illustrator whose most recent work can be seen in The New York Times bestseller "Amazing Fantastic Incredible Stan Lee". Her work has also appeared in "Sandman" by Neil Gaiman. She was Artist in Residence at the Smithsonian Institution, and lectured at The Maryland Institute College of Art and Design, The Australian Society of Authors, and has exhibited and lectured in galleries, museums and exhibits around the world. Books featuring her work have received the Eisner Award, The International Horror Guild Award, and the Harvey Award.